The Gambian dictator who suffered a humiliating defeat at the hands of a real estate agent named Adama Barrow, is reportedly at this moment planning to put into action Plan B that involves a staged coup d'etat that, he hope. will restore him to power. 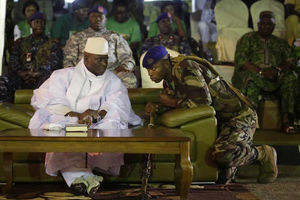 Since he accepted the results of the elections of last Thursday which saw him losing with 40% of the vote to Mr. Barrow.s 43% and before he conceded the following day, Yaya Jammeh has been under tremendous pressure from the military brass and party militants to reverse the verdict of the Gambian people. The top military brass that are in on the plan to subvert the will of the people are General Saul Badgie and Brigadier Generals Umpa Mendy stationed as State House (where they are currently meeting) Borra Colley and Musa Savage who are stationed at Kanilai. All felt betrayed by Jammeh when he conceded defeat and they have been demanding that Jammeh reverse the decision of the Gambian voters - a move fraught with danger and uncertainty because how the Gambian voters and ordinary citizens will react to will amount to a slap in the face. How the European Union and the Obama administration will react to the first electoral loss of a brutal dictatorial regime through the ballot box without a drop of blood being shed is equally uncertain. Ousman Badgie the country's Chief of Defense Staff and Yankuba Sonko the Inspector General of Police appear to be isolated and excluded from the planning of the plot of a staged coup attempt. The civilian supporters and party militants of the former ruling party have joined the illegal plot to subvert the will of the Gambian people. Included in this group of subversives are Pierre Minteh welfare officer the Washington DC Gambian Embassy, Seedy Njie, Babou Gaye Sonko and Papa Litty Nyang all members of the National Assembly, Samsudeen Sarr of the Gambian Mission at the United Nation, Foday Chorr of the UK and numerous others. As the party militants plan to demonstrate in support of restoring Jammeh to power, Plan B was being put into effect is the evacuation of Jammeh's family. According to sources, anyone of the Kanilai household with a valid visa is scheduled to join former First Lady Zainab Suma Jammeh, her son Muhammed Jammeh and her sister. They are scheduled to depart for the United States, Sunday evening but not before the official plane which should have been at the disposal of the President-elect laden with their personal effects of bank notes, jewelry and other valuables. The Central Bank and the government-controlled Trust Bank are expected to be looted by the Jammeh family on their escape to the United States. The departure of Zainab Jammeh and her entourage Sunday evening under the cover of darkness and a Jammeh-imposed curfew, will signal the beginning of the implementation of Plan B in an attempt to reverse the verdict of the December 1st presidential elections which was won fair and square by Hon. Adama Barrow. The exact date when the plot will actually start to unfold is unknown at this stage but we will continue to cover it as a developing story. Jammeh to ECOWAS: "I will not step down"
Ibn Chambers to Jammeh : "The end is here"
Conversations with Amadou Samba:"I was never a business partner of Jammeh, I managed him."